Vehicle was used to connect railroad line at Shaniko with emerging community of Bend. Automobiles were in the infancy stage in 1905 when an auto stage was ordered to be built exclusively for use to connect the railroad lines at Shaniko with the emerging community of Bend. The first auto stage to leave Shaniko for Bend was a history-making event. Bend was a slow-growing community in 1905, with progress impeded by inadequate transportation. The nearest railroad was located at Shaniko, which was 95 miles away, over rugged wagon roads. The only transportation from Shaniko was by stagecoach or slow-moving freight wagons. The Deschutes Irrigation and Power Co. was an emerging company that determined that there was a need for a horseless carriage to patrol their interests in Central Oregon. They imported one of the first automobiles in Central Oregon to be used for transportation. They soon determined that they needed a better transportation service to attract settlers to lands they were attempting to sell. An advertising campaign lured interested capitalists to Shaniko by train to promote the great potential of farming and agriculture in Central Oregon. Potential investors observed great wheat fields, towering mountains and scenic vistas, but they experienced the painful bouncing and rugged travel by stage to Bend. Most investors were not inclined to invest in such an isolated region with poor transportation. It was suggested that an automobile be constructed to be used as an auto stage to attract investors and settlers. It might make the town of Bend seem less like a godforsaken place. William Gill was engaged by the Deschutes Irrigation and Power Co. to construct the auto stage. He was partnered with his father in the Gill Gas Engine and Machine Co. in Portland. They specialized in manufacturing logging equipment and marine gas engines. The bus was completed in March 1905. It had taken more than five months to build the bus. The huge automobile had four seats, solid rubber tires, four 6-inch bore cylinders, and could reach a maximum speed of 40 miles per hour. It weighed 6,800 pounds and surprisingly was equipped with air brakes. The total cost for the bus was $2,500. It became known as the Thomas Flyer. A trial run was accomplished shortly after completion of the vehicle, and William Dewey Tyler was the driver. The car completed the drive from Shaniko to Bend flawlessly. The first run for the new auto stage route between Shaniko and Bend was started on April 13, 1905. The machine created a sensation. The fare for the 95-mile trip was $9.45. The run could be made in good weather and no mishaps in five hours. Unfortunately, the roads were not adequate for maximum speed. It soon appeared that it was only a scenic and pleasurable drive from Shaniko to Bend instead of a tedious and painful journey. The bus was the first automobile to be utilized for intercity travel in the United States. 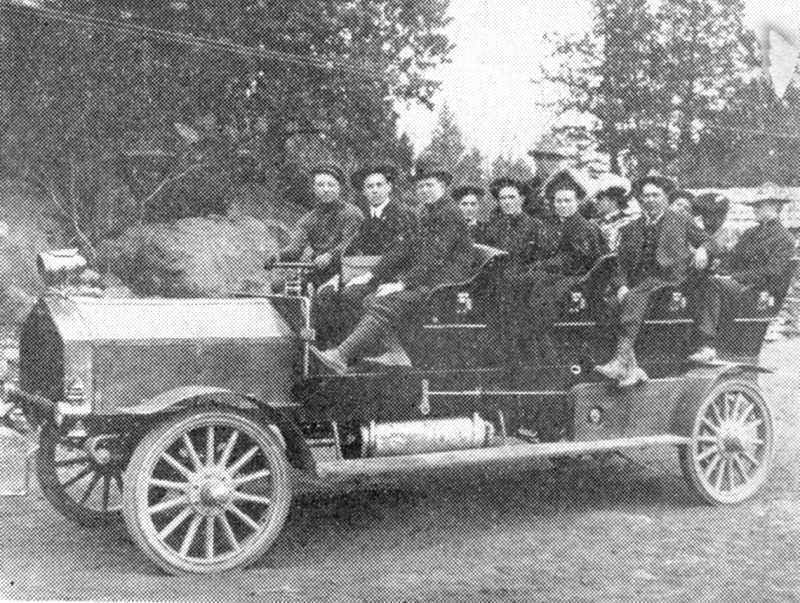 The speed of the bus and narrowness of the roads at first created some major concerns to other traffic, such as freight wagons or stages, but once the usefulness of the auto was shown, other vehicles soon began to be utilized, and the automobile era in Central Oregon had begun.